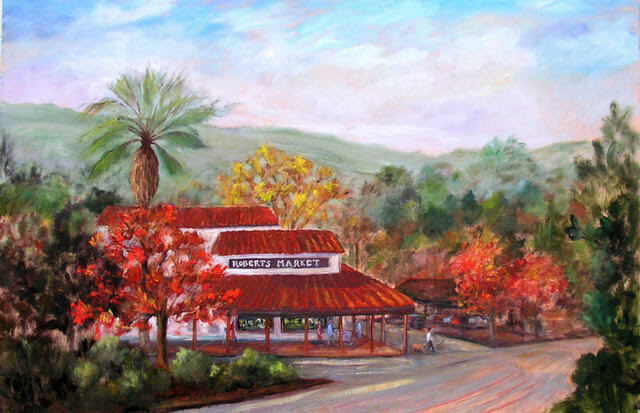 Longtime Woodside resident and physician at Stanford University Hospital, Vicki Coe Mitchell started painting as a child with her father. Following a long hiatus for college, medical school and residency, she resumed painting after moving to Woodside and needing art for her own walls. Formal training began in 2000 after opting for a part time medical practice. Mentors include Joan Jordan, Lorraine Scherba, Lora Groves, Ray Mendieta, Jim Caldwell, Tom Chapman,Claire Verbiest and Nancy Reyner. Vicki is a graduate of Smith College, Medical College of Pennsylvania, and Stanford University. She is a member of the Half Moon Bay Plein Air Painters, Coastal Art League and in 2014 she organized the Woodside Plein Air Painters. Currently Vicki is a member of the Woodside Art and Culture Committee, dedicated to promoting the arts in Woodside. Other activities include The Village Hub Launch Team, Woodside Emergency Preparedness Committee, and the CERPP Operations and Logistic Committees. While many people enjoy a particular painting they just don’t have the space for an original, so I have used images of my paintings to create unique, useful gifts such as canvas grocery bags, greeting cards, mousepads, coffee table books, and serving trays just to name a few. A small collection of original plein air paintings and prints will be on display as well.